Now we are at the end of January, those new year’s resolutions decided on might seem like a dim and distant idea, thought up on tide of celebration, but perhaps now a little over-zealous. The promises to keep yourself fitter, healthier, tidier, more spontaneous, more patient or more organised become much harder to stick to with the cold weather and dark mornings dampening spirits! But fear not, thankfully there is one resolution that is easy to stick to and can solve many of those winter blues; helping us escape to faraway lands, meet new people and have new adventures without even leaving the house. Reading! Like anything, reading is a habit and if it’s not one you included on your list of resolutions, perhaps discovering some brilliant new books will help encourage you, your children, pupils or colleagues. As an adult, reading children’s books can be a great way to kick start a reading habit and if you're a parent or work with children, you’ll be able to recommend with insight - something that is absolutely essential in supporting young readers. Shared reading experiences can be some of the most powerful and this is made all the easier with many wonderful new publications for spring in the world of children’s books. I can safely say that picking up one of these books will help you, your children or those young people you work with get into reading – so that it becomes more than just a resolution! I am a huge fan of picture books and firmly believe you are never too old to enjoy them. 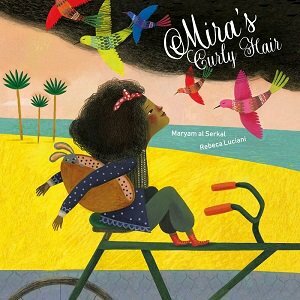 Two beautiful examples of these out for spring are Maisie's Scrapbook by Samuel Narh & Jo Loring-Fisher and Mira’s Curly Hair by Maryam Al Serkal and Rebeca Luciani. Maisie’s Scrapbook celebrates a mixed-race family and the love that binds us all together and Mira’s Curly Hair is heart-warming story about having the courage to be yourself. Both titles features lovely, colourful illustrations bringing the characters to life and ensuring young readers will be captivated by the joyful narratives. If you prefer something a little more irreverent, try The Astro Naughty Naughty Baddies by Mark Sperring & David Tazzyman, a very funny tale involving aliens, badmobiles and intergalactic impishness certain to bring a smile to your face. Another gorgeous title for spring is Wish by Chris Saunders, the touching story of Rabbit, who demonstrates the magic of friendship and kindness, brought to life with beautiful muted artwork and a simple rhyming narrative. For those young readers beginning to gain confidence there are some brilliant books to entertain them. 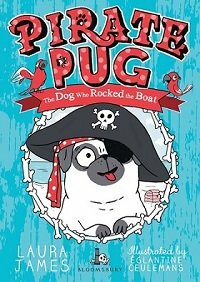 A particular favourite of mine is The Adventures of Pug series by Laura James, illustrated by Eglantine Ceulemans, with the latest title Pirate Pug taking Pug and his best friend Lady Miranda off to the seaside on the trail of buried treasure. Fun, entertaining, full of colour, this is great to read aloud and share but be warned, you may find yourself desperate to get a roly-poly pug! For more confident readers is the first in a new series from author Gwyneth Rees, illustrated by Becka Moor - Super Cats might have feline friends vying for your attention. I love the idea of this story – cats with super powers; from super claws to super teeth to super strength and lots of YOWLING. And full of fun too, great for the superhero generation. A superhero of a different kind takes centre stage in Laura Norder by Guy Bass illustrated by Steve May. A laugh-out-loud fun tale featuring a feisty cowgirl sheriff, who has trouble on her hands as she tries to get everyone else to play by the rules. There’s so much choice with middle grade fiction it’s almost impossible to decide what to read, but a great way to encourage readers is to give them stories that make them laugh. 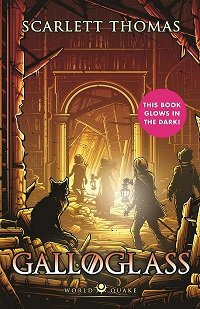 The brand new middle grade title from author Jennifer Killick (who wrote the hilarious Alex Sparrow series) illustrated by Gareth Conway, Mo, Lottie and the Junkers. It’s quirky, funny and full of Jennifer’s trademark banter between friends, so sure to make you laugh out loud. And the first in a new series Little Badman and the Invasion of the Killer Aunties by Humza Arshad and Henry White, illustrated by Aleksei Bitskoff brings leaping to life 11-year-old wannabe rapper, Humza Khan and a very funny fast-paced adventure story, full of mischief. For those who prefer something more fantastical, The Midnight Hour by Benjamin Read and Laura Trinder is definitely one to look out for with a very feisty heroine, madcap adventure, brilliant world building and a whole host of creepy creatures, heroic deeds and even a mystical figure called ‘The Library’ – who of course I loved. If mystical – or rather mythical - creatures are of interest then you will no doubt be aware of the hotly anticipated epic finale to the Who Let the Gods Out? series, Against All Gods by Maz Evans. You won’t fail to be thrilled by Elliot’s final battle, with the future of mankind and all he holds dear at stake. Another fantasy epic with a new title publishing is the Worldquake series by Scarlett Thomas. Galloglass is book number three and continues the adventures of Effie and her friends as they discover more about their powers and the strange reality of the Otherworld. Expect more dastardly plotting and great action scenes as the world comes close to destruction! Reading provides such a great opportunity for escape but also time to reflect and find real empathy for the characters you meet. Historical fiction can also often be a catalyst for understanding lives and times very different from our own. This is true of the brilliant new book from Karen McCombie Little Bird Flies set in Victorian times on a remote Scottish island. It’s the beautifully told story of Bridie, her dreams of escaping to America and how she and her family find their simple crofter’s existence irrevocably changed by tragedy. Surviving changing times is the theme of another middle grade literary novel, by Cory Leonardo, Call me Alastair. It’s not very often that the central protagonist of a story is a big grey parrot! But he’s the perfect hero of this big-hearted novel, giving a bird’s eye view of love and the belief that we can all learn to live in freedom. These are just some of the fabulous titles available this spring for children to enjoy. With books as brilliant and diverse as these, there’s something to suit every child! If you have a younger child, why not set yourself a challenge to read with them as much as you can throughout 2019? Just 10 minutes of reading time a day will make a difference. Visit your local library or bookshop with older children and encourage them to choose books they’re excited about. Watch this space for a round-up of some of the fantastic non-fiction titles coming this spring. With thanks to the publishers for sending these books for review: Barrington Stoke, Bloomsbury, Canongate, Chicken House, Firefly Press, Lantana, Nosy Crow, Puffin, Scholastic and The Quarto Group.